Industrial robot maker Yaskawa Electric has teamed up with megaconglomerate Mitsui & Co., Ltd. and packaging system manufacturer Hokusho Co., Ltd. to develop a parcel sorting system that employs agile robot workers capable of quickly classifying and separating small items such as mail packages and clothing. The system, now being demonstrated at one of Hokusho's factories, employs Yaskawa's Motoman-DIA10, which features a pair of smooth-moving, seven-axis robotic arms mounted on a human-sized torso. Yaskawa joined forces with Mitsui in 2006 with the aim of developing new types of robots that can play a role outside the manufacturing sector and help support Japan's shrinking and graying population (and workforce). 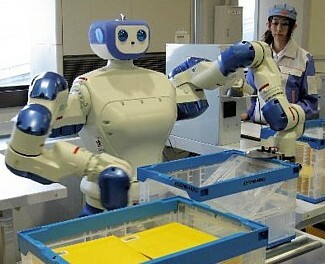 As the first step toward that goal, the companies have combined the Motoman-DIA10 with Hokusho's piece assorting system (PAS) technology to create a robot that works quickly and can be easily moved to and from its work station, making it an ideal backup or replacement for human workers engaged in sorting operations. In the demo system, the robot picks up a package as it arrives at its station, reads the attached barcode to understand the package's destination, and places it on the appropriate conveyor belt to send it on its way. In the past, robots have been slow to land jobs performing light operations such as this, because humans have a proven track record of working faster. However, this robot is able to sort about 1,000 items per hour -- just like a seasoned human pro. The companies have yet to put a price tag on their new workers. This is only a step in the right direction. Robots are only going to become more integral parts of our lives. Menial and mindless tasks should be rightfully given to our robotic counterparts. Leave the critical thinking to us--I think. Great story. One of the many great uses for Robots to replace cheap menial labor :-). There was an interesting and realated article about more progress in this direction and what Rod Brooks at MIT's Computer Science and Artificial Intelligence Laboratory (CSAIL) wants to do with robots in the future.